Although the company unveiled a range of updates at Cloud Next this week, it faces a long slog as it seeks to displace Microsoft in the workplace. SAN FRANCISCO – Google may not usurp Microsoft’s office productivity dominance anytime soon, but the raft of updates to its G Suite portfolio rolled out at its Cloud Next event this week aim to build momentum as it woos business users with artificial intelligence (AI) and cloud capabilities. “One of the biggest themes of Google Next this year is the use of machine learning for better customer experience,” said Wayne Kurtzman, a research director at IDC. There are now 4 million businesses paying for G Suite, Google’s collection of productivity and collaboration apps that includes Gmail, Docs, Sheets, Hangouts Chat and Meet. “Since last year we have added more than one million businesses to G Suite, and the momentum we are seeing is across the globe and across companies of all sizes,” Garrick Toubassi, vice president of engineering for G Suite, said Wednesday. The company has doubled the number of users since former VMware CEO Diane Greene took over Google’s enterprise cloud arm in 2015. Toubassi highlighted G Suite’s potential for growth: more than 80 million students currently access the productivity tools. “Businesses that are adopting G Suite increasingly realize that the workforce of tomorrow expects cloud-based collaboration,” he said. The new Gmail, which debuted for consumers earlier this year, is now generally available for all G Suite customers, with a freshened UI and beefed up security. Enhanced Cloud Search, which can now find employee data across all business apps in the cloud and on-premises. Launched last year as a means of indexing G Suite information, Cloud Search serves as a replacement for the Google Cloud Appliance, one of the firm’s first attempts at an enterprise product; it will be discontinued in 2019. Telephony, the missing piece of Google’s unified communications portfolio, has been added with an “enterprise-ready” version of Google Voice. While Google promised to continue to support third-party platforms, Voice will be powered by AI, with automated transcription and spam call filtering. It’s currently available as a beta. And a standalone version of Drive Enterprise, the company’s cloud content storage and collaboration tool. The updates are “nice, incremental features,” said Patrick Moorhead, founder and principal analyst at Moor Insights & Strategy, but won’t on their own move the needle significantly in terms of competing with Microsoft. It has a dominant position in the enterprise with its on-premise Office suite as well as its Office 365 platform. “I don’t think any of this spells checkmate for Microsoft and Office 365,” Moorhead said. Alan Lepofsky, vice president and principal analyst at Constellation Research, said that the elements of AI that Google is bringing to G Suite, such as Smart Reply for Hangouts Chat and Smart Compose in Gmail, will help people “get work done faster, more accurately and even more creatively.” But he said there’s little to show Google is pushing a major change in the way that work is done by large organizations. According to Gartner Inc., G Suite had a 9% share of the $17.1 billion enterprise office suite market in 2016, compared to 90% for Microsoft. Despite being the underdog, Google has seen growth among business users, said Raúl Castañón-Martínez, a senior analyst at 451 Research. “G Suite is still far behind Microsoft in terms of paying customers, but Google is rapidly gaining customer traction and now has a significant share of the market,” he said. Google Cloud Chief Diane Greene at the company's Cloud Next event. That is, in part, thanks to a strong partner ecosystem that will continue to attract more large organizations going forward, he said. 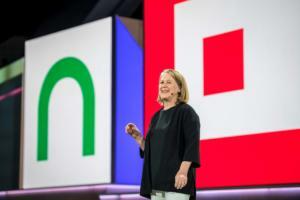 As Google Cloud chief Diane Greene noted during her keynote presentation Tuesday, Google now has 12,000 channel partners and links with major integrators such as Accenture and Deloitte. There are also an increasing number of integrations with major business software vendors such as SAP and Salesforce – all of which helps burnish G Suite’s enterprise credentials. As Google continues to build out its enterprise operations, getting its message out to a wider range of prospective customers remains a priority. “One of the challenges Google has had for a number of years is that many people perceived it as more of a consumer brand,” said Wayne Kurtzman, a research director at IDC. But Google has “closed that gap” over the past two years, he said, thanks to a strong pipeline of business-focused product announcements. As an example, the decision to make Drive Enterprise a standalone product could provide an on-ramp to G Suite, particularly for businesses eyeing a move away from on-premise tools.